GroupM, the world’s leading media investment management group, has entered into an exclusive partnership with Networked Insights to give all its employees access to Kairos, Networked Insights’ marketing analytics platform. The global implementation will enable GroupM agencies to adaptively plan and continuously optimize client campaigns using real-time consumer data from the social web. After successful work with mutual clients, GroupM selected Networked Insights to enhance audience segmentation, content strategy, media investment and brand health diagnostics for all its agencies. Using Kairos, GroupM teams will gain actionable audience insights from the social web to inform media planning. The exclusive partnership gives more than 27,000 GroupM employees access to Networked Insights’ Kairos platform, including team members at Mindshare, MEC, MediaCom, Maxus, Xaxis and other GroupM specialist service businesses supporting many of the world’s largest brands. Kairos is Networked Insights’ flagship SaaS platform that classifies and organizes the entire social web to give marketers a deeper understanding of their opportunity audiences, brands and campaigns. The platform provides insights not found in social media monitoring tools, including consumer emotion and interests, brand health metrics like purchase intent and customer loyalty, and the “why” behind spikes in conversation. The real-time consumer insights available through Kairos help brands connect with their opportunity audiences. 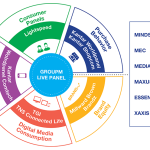 GroupM is the leading global media investment management operation serving as the parent company to WPP media agencies including Mindshare, MEC, MediaCom, and Maxus, each global operations in their own right with leading market positions. GroupM’s primary purpose is to maximize performance of WPP’s media agencies by operating as leader and collaborator in trading, content creation, sports, digital, finance, proprietary tool development and other business-critical capabilities. GroupM’s focus is to deliver unrivaled marketplace advantage to its clients, stakeholders and people. Discover more about GroupM at www.groupm.com. At Networked Insights, we enable brands to connect with and expand their opportunity audiences. Our solution, Kairos, analyzes and organizes real-time consumer data from the social web to uncover strategic, actionable insights. Kairos helps brands deeply understand their opportunity audiences, create content that connects with them, choose the right media investments, and track the connectedness of those audiences.